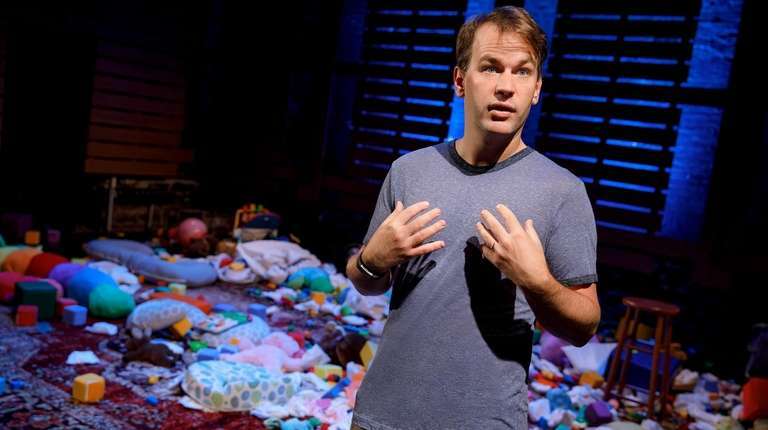 WHERE Cort Theatre, 138 W. 48th St.
BOTTOM LINE Mike Birbiglia's entertaining explanation of becoming a father when he really didn't want to. It’s like being vice president: “huge title, no power.” Mike Birbiglia is talking about becoming a father and he’s got issues. In “The New One,” his smart, entertaining one-man show that just opened at the Cort Theater after a sold-out run Off-Broadway, the comedian painstakingly outlines the many reasons he never wanted to be a dad. In lesser hands, this would be little more than an extended stand-up routine, but Birbiglia, whose most recent solo shows went on to become Netflix specials, is a fine storyteller with solid acting chops (film roles in “Trainwreck” and “The Fault in Our Stars,” two seasons on “Orange Is the New Black”). Plus, he stresses intense love for his wife, Jennifer Hope Stein, a poet credited with additional writing for the show, acknowledging with impeccable comic timing and some real emotion why he felt reluctant to mess things up with a baby. Directed by Seth Barrish, Birbiglia tells the story as if for the first time, sharing a litany of gory details, from the indignities of fertility issues (he actually brought his urologists on Jimmy Kimmel) to the ramifications of the expectant mom’s raging hormones. Along the way, he dispenses with the hilarity and sneaks in some valid concerns about bringing a child into a world of rising sea levels and environmental neglects, along with one infuriating (to me, anyway) comment about understanding why some men leave. Once baby Oona arrives, Birbiglia, like many fathers, finds himself in a competition he can’t hope to win. “I didn’t know what ‘nothing’ meant until I became a dad,” he laments. But for this man, who’s made a career in the joke business, the eventual breakthrough should come as no surprise. Playing a silly game, he realizes he can make his daughter laugh “the hardest I’ve ever seen anyone laugh in my whole life.” In that moment, we know he’s going to do all right as a father.